Microsoft 2019 Professional Plus is ready for your success. All the core programs have been updated with new, more powerful features and better cloud integration. Word 2019, Excel 2019, PowerPoint 2019, Access 2019, Publisher 2019, and Outlook 2019 are all here in Office 2019, ready to help you take your documents and presentations to the next level. Microsoft Office 2019 Professional Plus has everything you need, whether you are a home user, student, or large corporation in business. This is a major upgrade of the popular office suite has new features across the board. The new features greatly enhance productivity, give you better data analysis, and help you promote more efficient collaboration and team communication. There are a many improvements in the latest version of Word. All of the features you love from previous versions are here, along with new templates, 3-D effects, shadows, SmartArt graphics, and better, more refined inking features that includes advanced support for better sensitivity on touch screens. Word 2019 makes it easier to collaborate and it is more secure than ever. The 2019 release of Excel offers powerful, easier to manage data analysis and forecasting features. With Power Query, pull data for analysis from almost anywhere, including websites, SQL, Access, and other databases.You get new charts and new ways to present your data, better cloud integration, and advanced features to help you work smarter and better. PowerPoint has been updated with more powerful collaborative features, new visual effects, an enhanced Designer bar to optimize the layout of slides and new animations, morph and other transitional effects, and more ways to bring your presentations to life. With improved cloud integration, sharing your ideas over the web and with co-workers is easier than ever before. OneNote has been updated for better performance. Keep your notes, spreadsheets, and other files in one place and share them with team members to collaborate on projects effortlessly. The new inking features are integrated into all of the apps, including OneNote. Outlook gets a lot of new features and functionality with Office 2019’s focus on better, easier, more effective email management. With these new features and functionality, Office 2019 makes communications and email a top priority. Outlook 2019 includes features like @mentions, updated contact cards, Office 365 Groups, and a focused inbox. 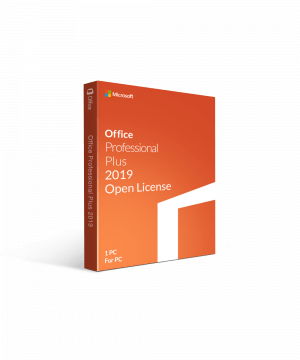 Microsoft Office 2019 Professional Plus includes Access 2019 and Publisher 2019, making it the ideal edition of Microsoft for businesses of all sizes. With some enhancements to the interface, new, more powerful tools and features, and more advanced and seamless integration with the cloud, Microsoft Professional Plus is a better experience than ever. • OS: Windows 10. Office 2019 is not supported on Windows 7 or Windows 8. CAD$699.90 | In Stock Want it Now? Order and receive your download instantly.